LIKE WHAT YOU HEAR? Although these genealogy podcasts are freely available to anyone with a computer (and a working set of speakers) consider supporting DearMYRTLE's FAMILY HISTORY HOUR weekly broadcasts. Available 24/7. If the audio file page fails to load in a minute, then try again later. A large number of simultaneous listeners can overtax the server. Dial-up listeners can expect the process to take longer. This is the lineup for today's show, now available for you to listen to 24/7 on the web. Please also note the "Links We Mention" and "Listening to the Show" directions below. I think you'll enjoy hearing my guests this week! Frank Koerner, B.S. 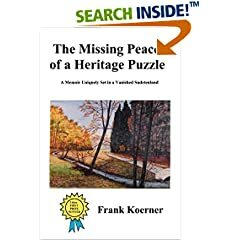 Physics, Juris Doctorate, author of The Missing Peace of a Heritage Puzzle : A Memoir Uniquely Set in a Vanished Sudetenland Frank was born and raised in New Jersey, but his parents were immigrants from Moravia. He is a cyber security analyst, having published many technical articles in that arena. He lives in San Diego, CA with his wife Elke and their two cats, Fussi and Missy. Find his book at Amazon.com and other online bookstores. of real people who are not just names on a page." MIGHTYMOUSE TOUR This week Myrt explains the process for bypassing the semi-reliable email delivery of her columns in favor of her BLOG. Just what are BLOGs anyway? 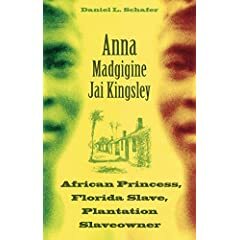 Anna Madgigine Jai Kingsley: African Princess, Florida Slave, Plantation Slaveowner by Daniel L. Schafer. University Press of Florida: March 2003. ISBN: 0813026164. The title came to my attention because Schafer is the featured speaker tomorrow morning at the Florida Heritage House Museum at Manatee Community College here in Bradenton, Florida. "Gmail is an experiment in a new kind of webmail, built on the idea that you should never have to delete mail and you should always be able to find..."
Listen-as-you-click Method #1 - OurMedia.org This link opens another webpage, with an online audio player. You may have to click the play button several times before the file will play, particularly on slow internet connections. Listen-as-you-click Method #2 - Archives.org This link downloads the file, then opens the default .mp3 player on your computer.